What goes around comes around, and seems to be coming around all the time these days. 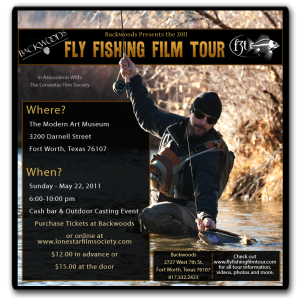 This time it’s Fort Worth’s Backwoods turn to host the tour, and the Fly Fishing Film Tour will be Sunday May 22, 2011, at the Modern Art Museum. As long as you are in Fort Worth’s Museum District, be sure to check out the show “The Hudson River School Paintings” at the Amon Carter Museum. I saw it last week, and it was simply incredible. It includes, Leading figures of the Hudson River School, including Thomas Cole, Frederic Edwin Church, Jasper Francis Cropsey, Asher B. Durand, George Inness and John Frederick Kensett, and others.” As long as you are on that floor of the museum, be sure to take time to check out the photography as well. Part of the photography collection showing includes, Denton’s own Carlotta Corpron (my wife used to throw her newspaper). Click on the poster to enlarge and take off your magnifiers! pm on Sunday, May 22nd. cutting edge films to both entertain and educate outdoor enthusiasts. outdoor entertainment and want to catch the tour, this is your chance. This stop on the world tour is hosted by your friends at Backwoods. Austin, Fort Worth, Norman, Oklahoma City, Omaha, Overland Park, St.
exclusive portal to whatever type of adventure you seek. For more information, visit www.backwoods.com. Dang! I could go. Who else is going? Mike, I will be there.. See you around. It all depends on how things go at the Lake Fork “WORLD CHAMPIONSHIPS” on Saturday. If I don’t place, I’ll just have to fish another day to feel better about myself. If I do place, I’m getting the heck outta’ Dodge. This should be a great event. Are you going to have a chance to come? I would like to have a chance to put a name and face together.